The holidays are such a wonderful and magical time of year. A time when all the ovens rev up and pump out all the sweetness of the holiday. 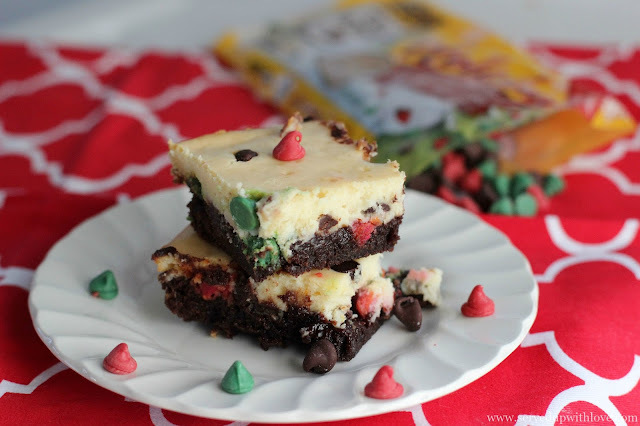 These Brownie Chocolate Chip Cheesecake Bars are sinfully delicious and the perfect treat to start off your holiday baking. Baking is my therapy. I tend to do a lot of baking around the holidays, cookies, cakes, brownies, treats, you name it. So I get super excited when all the holiday baking ingredients start showing up in our local Walmart. Whenever the mood strikes to bake I like to have a stock of baking ingredients in the pantry. These NESTLÉ® TOLL HOUSE® Semi-Sweet Chocolate Morsels and NESTLÉ® TOLL HOUSE® Holiday Morsels make the perfect cookies without a lot of fuss. And fudge is not fudge without the NESTLÉ® CARNATION® Evaporated Milk. It adds just the right amount of creaminess. 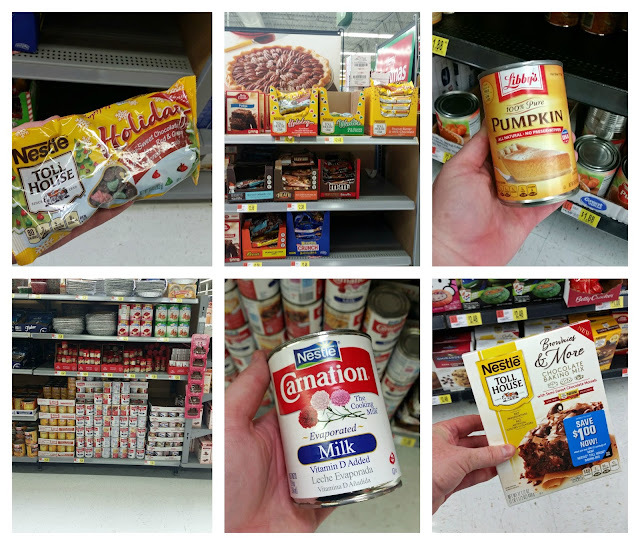 With all those pumpkin and cranberry bread loaves I plan to give away, Libby’s® 100% Pure Pumpkin is a must to keep on hand. Every year during the holidays I have a long list of cookies and treats that I intend on baking. I am some what an overachiever when it comes to the holidays. Us moms tend to do that, don't we? Each year gets busier and busier making that list even harder to complete. I am striving for balance this year and will take the time to just breathe. Because spending time with my loved ones is more important than crossing something off my list. 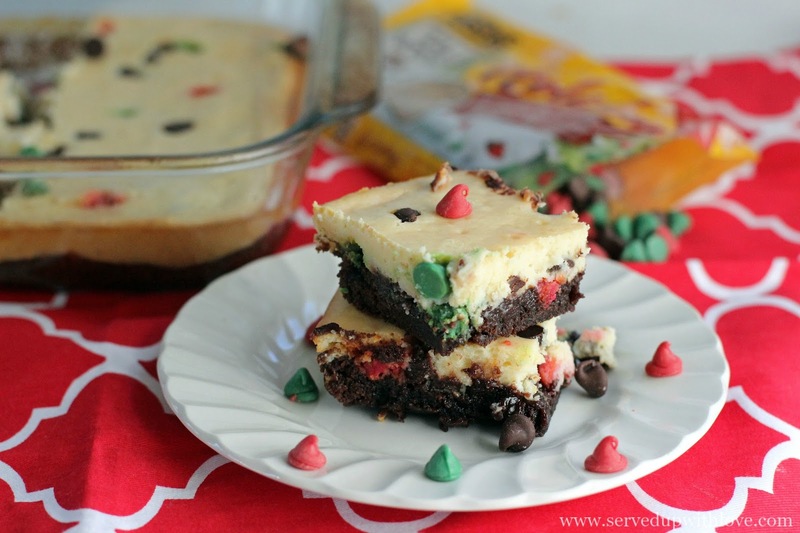 These Brownie Chocolate Chip Cheesecake Bars could not be any easier to make. 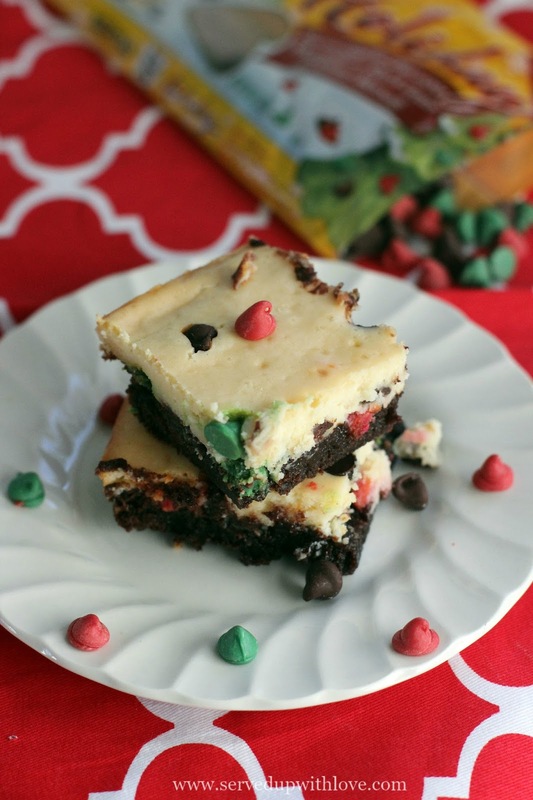 Using a boxed brownie mix and those NESTLÉ® TOLL HOUSE® Holiday Morsels allow me to whip up this sweet treat and spend more time with my family instead of all day in the kitchen. These are ooey, gooey, and oh so good! Do you do a lot of baking during the holidays? I would love to know how you bake holiday goodness in your kitchen. Preheat oven to 350ºF. Grease a 9x13 baking dish with nonstick cooking spray. Prepare brownie mix according to directions on package. Pour batter in the baking dish. Beat the cream cheese, butter, and cornstarch until fluffy. Gradually beat in the sweetened condensed milk, egg, and vanilla until smooth. Stir in the holiday chocolate chips. Pour cream cheese mixture over the brownie batter. Bake for 45 minutes. Allow to chill in the refrigerator. Allowing to cool allows for better slicing. Make sure to follow this Flavorful Moments board on Pinterest for more great recipe ideas! Happy baking!